Landscaping can be defined as the addition of plants, manipulation of terrain and the construction of structures. There are many different styles of landscaping to choose from. Photo by Ray Kachatorian. Landscapes can be purely aesthetic or serve a function such as outdoor cooking. Plants - The addition of ornamental, edible, native or other types of landscaping plants. Terrain - Changing the shape of the land through grading, backfilling, mounding, terracing, etc. Structures - Constructing fences, patio covers, walls, decks, raised planters or other built features. People have practiced landscaping for centuries. As far back as the ancient Mayans, humans were manipulating the land for both aesthetic and practical reasons. The addition of plants, changes to the existing terrain and the construction of structures are all part of landscaping. Today landscaping refers to the planning, laying out and construction of gardens that enhance the appearance and create useable space for outdoor activities around a home. When it comes to landscaping, the options abound. Some people want a perfectly balanced combination of hardscape (patios) and softscape (plants). 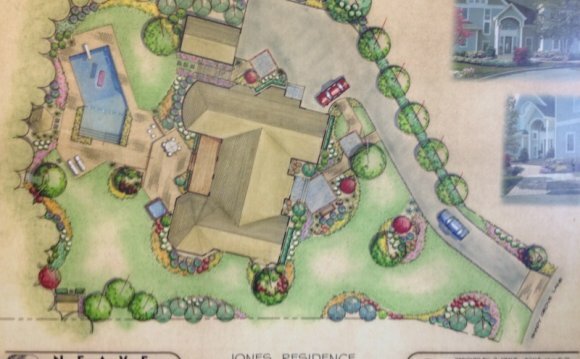 Some people want a sustainable landscape design that saves water and creates a natural habitat. While other people want to recreate a certain garden style they find appealing, such as modern or tropical. Still others want a space complete with an outdoor kitchen, fire pit and swimming pool where they can entertain friends and family. Whatever you desire, make sure you communicate this clearly to the pro you are working with. The internet is a good place to gather ideas for your own landscaping project. Start by browsing landscaping pictures and take note of what you do and do not like. Next, look at examples of local landscaping projects to determine what works in your area. Finally, research and learn about the specific features you would like to include in your landscape. The Landscaping ProcessLandscaping is a task that combines science and art. Armed with horticultural knowledge, as well as familiarity with the elements and principles of landscape design, a landscape professional can help you transform your property. The landscape architect, designer or contractor you choose to work with will guide you through the landscaping process, which consists of a design and construction phase.